I don’t see any new functionality or blog posts. Has the developers jumped ship or have I missed something? 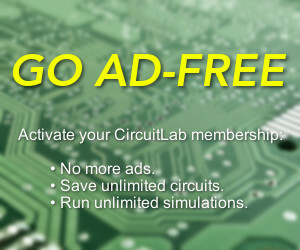 I am brand new to circuitlab. So far it has been extremely helpful and easy to use. I am eager also to know if support will continue. I do note that the community certainly still seems to be active. Over in Electronics Q&A there is plenty of activity in 2019. 2018 was our biggest year ever on many metrics. Much of the active work going on is on the textbook, which is a massive amount of effort per page. If you haven't seen that yet, please take a look. I have sent you email several times about the renewal of my account. This is why I wonder if there is something wrong. Would you reply to my email, please? I am delighted to hear that you are still a going concern. Appreciating it more every day. In addition to it being the quickest way to get to sims, it is one of the most straightforward schematic editors I have ever encountered.